Kakoui, N., Nikzad, M., Ghoreyshi, A., mohammadi, M. (2018). Extraction of pectin from sour orange and its application as the adsorbent for removal of nickel from aqueous solution: Kinetic and equilibrium study. Iranian Journal of Chemical Engineering(IJChE), 15(2), 3-21. N. Kakoui; M. Nikzad; A. A. Ghoreyshi; M. mohammadi. "Extraction of pectin from sour orange and its application as the adsorbent for removal of nickel from aqueous solution: Kinetic and equilibrium study". 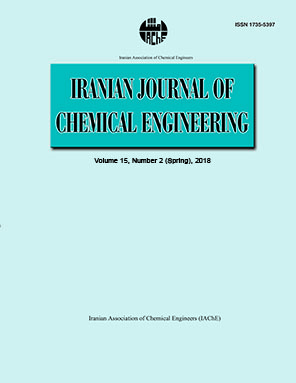 Iranian Journal of Chemical Engineering(IJChE), 15, 2, 2018, 3-21. Kakoui, N., Nikzad, M., Ghoreyshi, A., mohammadi, M. (2018). 'Extraction of pectin from sour orange and its application as the adsorbent for removal of nickel from aqueous solution: Kinetic and equilibrium study', Iranian Journal of Chemical Engineering(IJChE), 15(2), pp. 3-21. Kakoui, N., Nikzad, M., Ghoreyshi, A., mohammadi, M. Extraction of pectin from sour orange and its application as the adsorbent for removal of nickel from aqueous solution: Kinetic and equilibrium study. Iranian Journal of Chemical Engineering(IJChE), 2018; 15(2): 3-21. The present study investigates the potential applicability of the extracted pectin from sour orange pomace as adsorbent for Ni (II) removal from aqueous solution. Pectin extraction from the pomace was carried out using HCl and the highest pectin extraction yield of 26.75% was obtained. The Fourier transform infrared (FTIR) spectroscopy analysis confirmed that the structure of the extracted pectin was similar to the commercial one. The morphology and chemical characteristics of pectin beads were analyzed by scanning electron microscopy (SEM) and energy dispersive spectroscopy (EDX) techniques. The influence of several parameters including pH, initial metal concentration, adsorption temperature and time was studied to optimize nickel removal. The maximum Ni (II) removal of 85.1% was obtained at initial concentration of 20 mg/L and the highest adsorption capacity of 19.76 mg/g was achieved at nickel concentration of 100 mg/L. Kinetic and equilibrium studies were done to evaluate Ni (II) sorption from aqueous solution by the synthesized beads. Results showed that the sorption process follows a pseudo- second- order kinetic model. The equilibrium data were well correlated with Langmuir and Redlich-Peterson models by high regression coefficients. Rakhshaee, R. and Panahandeh, M., “Stabilization of a magnetic nano- adsorbent by extracted pectin to remove methylene blue from aqueous solution: A comparative studying between two kinds of cross-likened pectin”, J. Hazard. Mater., 189 (1), 158 (2011). Sriamornsak, P., “Chemistry of pectin and its pharmaceutical uses: A review”, Silpakorn University International Journal, 3 (1-2), 206 (2003). Wong, T. W., Colombo, G. and Sonvico, F., “Pectin matrix as oral drug delivery vehicle for colon cancer treatment”, Aaps. Pharm. Sci. Tech., 12 (1), 201 (2011). Cui, L., Wu, G. and Jeong, T. S., “Adsorption performance of nickel and cadmium ions onto brewer's yeast”, Canad. J. Chem. Eng., 88 (1), 109 (2010). Boudrahem, F., Aissani-Benissad, F. and Ait-Amar, H., “Batch sorption dynamics and equilibrium for the removal of lead ions from aqueous phase using activated carbon developed from coffee residue activated with zinc chloride”, J. Environ. Manage., 90 (10), 3031 (2009). mechanism of Cr (VI) adsorption onto activated carbon derived from wood apple shell”, Arab. J. Chem., 10, S252 (2012). Özçimen, D. and Ersoy-Meriçboyu, A., “Removal of copper from aqueous solutions by adsorption onto chestnut shell and grapeseed activated carbons”, J. Hazard. Mater., 168 (2), 1118 (2009). Imamoglu, M. and Tekir, O., “Removal of copper (II) and lead (II) ions from aqueous solutions by adsorption on activated carbon from a new precursor hazelnut husks”, Desalination, 228 (1), 108 (2008). Gupta, V. K., Rastogi, A. and Nayak, A., “Biosorption of nickel onto treated alga (Oedogonium hatei): Application of isotherm and kinetic models”, J. Colloid Interface Sci., 342 (2), 533 (2010). G., “Extraction, characterisation and enzymatic degradation of lemon peel pectins”, Carbohydr. Res., 282 (2), 271 (1996). Bochek, A., Zabivalova, N. and Petropavlovskii, G., “Determination of the esterification degree of polygalacturonic acid”, Russ. J. Appl. Chem., 74 (5), 796 (2001). Ranganna, S., Handbook of analysis and quality control for fruit and vegetable products, Tata McGraw-Hill Education, (1986). Mata, Y., et al., “Sugar-beet pulp pectin gels as biosorbent for heavy metals: Preparation and determination of biosorption and desorption characteristics”, Chem. Eng. J., 150 (2), 289 (2009). Department of Food Science, Chalmers University of Technology, (2000). Willats, W. G., Knox, J. P. and Mikkelsen, J. D., “Pectin: New insights into an old polymer are starting to gel”, Trends Food Sci. Technol., 17 (3), 97 (2006). Azad, A., et al., “Isolation and characterization of pectin extracted from lemon pomace during ripening”, J. Food Nutr. Sci., 2 (2), 30 (2014). Methacanon, P., Krongsin, J. and Gamonpilas, C., “Pomelo (Citrus maxima) pectin: Effects of extraction parameters and its properties”, Food Hydrocolloids, 35, 383 (2014). Zanella, K. and Taranto, O. P., “Influence of the drying operating conditions on the chemical characteristics of the citric acid extracted pectins from ‘pera’sweet orange (Citrus sinensis L. Osbeck) albedo and flavedo”, J. Food Eng., 166, 111 (2015). Kumar, A. and Chauhan, G. S., “Extraction and characterization of pectin from apple pomace and its evaluation as lipase (steapsin) inhibitor”, Carbohydr. Polym., 82 (2), 454 (2010). Monsoor, M., Kalapathy, U. and Proctor, A., “Determination of polygalacturonic acid content in pectin extracts by diffuse reflectance Fourier transform infrared spectroscopy”, Food Chem., 74 (2), 233 (2001). Sun, R. and Hughes, S., “Fractional extraction and physico-chemical characterization of hemicelluloses and cellulose from sugar beet pulp”, Carbohydr. polym., 36 (4), 293 (1998). Synytsya, A., et al., “Fourier transform Raman and infrared spectroscopy of pectins”, Carbohydr. Polym., 54 (1), 97 (2003). Kamnev, A. A., et al., “Comparative spectroscopic characterization of different pectins and their sources”, Food Hydrocolloids, 12 (3), 263 (1998). Kar, F. and Arslan, N., “Characterization of orange peel pectin and effect of sugars, L-ascorbic acid, ammonium persulfate, salts on viscosity of orange peel pectin solutions”, Carbohydr. Polym., 40 (4), 285 (1999). Liang, C. and Lee, P.-H., “Granular activated carbon/pyrite composites for environmental application: Synthesis and characterization”, J. Hazard. Mater., 231, 120 (2012). Amuda, O., Giwa, A. and Bello, I., “Removal of heavy metal from industrial wastewater using modified activated coconut shell carbon”, Biochem. Eng. J., 36 (2), 174 (2007). Krishnan, K. A., Sreejalekshmi, K. and Baiju, R., “Nickel (II) adsorption onto biomass based activated carbon obtained from sugarcane bagasse pith”, Bioresour. Technol., 102 (22), 10239 (2011). Y. and Lee, J., “Effect of preparation conditions on the adsorption of heavy metal ions from aqueous solution by mesoporous silica materials prepared using organic template (HDTMAB) ”, J. Chem. Eng. Data, 55 (9), 3667 (2010). Water Sa., 29 (2), 147 (2003). Kumar, R., Bishnoi, N. R. and Bishnoi, K., “Biosorption of chromium (VI) from aqueous solution and electroplating wastewater using fungal biomass”, Chem. Eng. J., 135 (3), 202 (2008). Patel, H. and Vashi, R. T., Chapter 4- Batch adsorption treatment of textile wastewater, In characterization and treatment of textile wastewater, 1st ed. Elsevier, Boston, USA, p. 111 (2015). Sharma, G., Pathania, D. and Naushad, M., “Preparation, characterization and antimicrobial activity of biopolymer based nanocomposite ion exchanger pectin zirconium (IV) selenotungstophosphate: Application for removal of toxic metals”, J. Ind. Eng. Chem., 20 (6), 4482 (2014). Hsieh, C.-H., et al., “Adsorption of copper ions onto microwave stabilized heavy metal sludge”, J. Hazard. Mater., 136 (2), 338 (2006). Foo, K. and Hameed, B., “Insights into the modeling of adsorption isotherm systems”, Chem. Eng. J., 156 (1), 2 (2010). Cataldo, S., et al., “Kinetic and equilibrium study for cadmium and copper removal from aqueous solutions by sorption onto mixed alginate/pectin gel beads”, J. Environ. Chem. Eng., 1 (4), 1252 (2013). Kim, N., Park, M. and Park, D., “A new efficient forest biowaste as biosorbent for removal of cationic heavy metals”, Bioresour. Technol., 175 (629), (2015). Vijayaraghavan, K., et al., “Biosorption of nickel (II) ions onto Sargassum wightii: Application of two-parameter and three-parameter isotherm models”, J. Hazard. Mater., 133 (1), 304 (2006). Shahbeig, H., et al., “A new adsorption isotherm model of aqueous solutions on granular activated carbon”, World J. Modell. Simul., 9 (243), (2013). Gimbert, F., et al., “Adsorption isotherm models for dye removal by cationized starch-based material in a single component system: Error analysis”, J. Hazard. Mater., 157 (1), 34 (2008). Horsfall, M. and Jnr Spiff, A., “Effect of temperature on the sorption of Pb and Cd from aqueous solution by by Caladium bicolor (Wild Cocoyam) biomass”, Electron. J. Biotechnol. 8, (2005). Lin, Y., et al., “Removal of Crystal Violet from aqueous solution using powdered mycelial biomass of Ceriporia lacerata P2”, J. Environ. Sci., 23 (12), 2055 (2011). Argun, M. E., et al., “Heavy metal adsorption by modified oak sawdust: Thermodynamics and kinetics”, J. Hazard. Mater., 141 (1), 77 (2007). Song, P., et al., “Optimization, kinetics, isotherms, and thermodynamics studies of antimony removal in electrocoagulation process”, Water, Air, & Soil Pollution, 226 (11), 1 (2015).